1. Click on the box "Gift Certificate Amount"
When you checkout a Special Gift Certificate Code will be sent to you which can be used for any online purchase on our website. 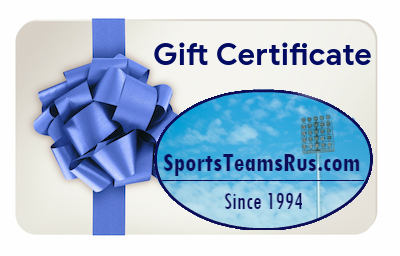 If you do not use the entire amount of the gift certificate on a purchase you may use the balance for future purchases at our online store, SportsteamsRus.com. The shopper buying the gift certificate can either use the Special Gift Certificate Code themselves or email it to a friend.